ROME, ITALY - OCTOBER 20th: Timelapse of tourists visiting Trevi Fountain in Rome, Italy on October 20th, 2017. 4k00:11ROME, ITALY - OCTOBER 20th: Timelapse of tourists visiting Trevi Fountain in Rome, Italy on October 20th, 2017.
hd00:14Rome Italy 17 June 2016. Time lapse (1440p) of tourists at renovated Fontana di Trevi. 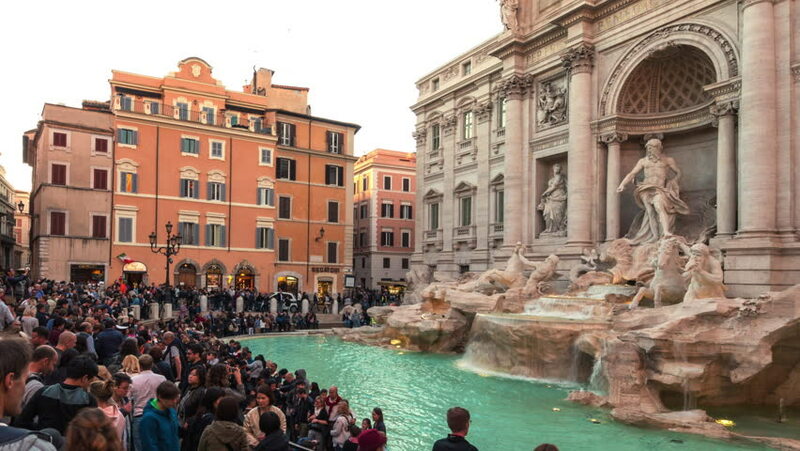 The Trevi fountain, after its renovation, gathers large crowds. Tossing a coin here will make you return to Rome. 4k00:10Rome, Italy - Oct 6, 2017: The Trevi Fountain is a fountain in the Trevi district in Rome, Italy. It is the largest Baroque fountain in Rome and one of the most famous fountains attracting tourist visiting Rome.